There’s a new study out suggesting that more than 60% of Americans go on-line to get their health care information. Whereas in the past, they might have called a doctor, relative or good friend for advice, these days people are reading blogs, listening to podcasts or posting comments, often relying on user-generated information. Over-reliance on the internet can also lead to over-reactions. Try plugging the words “red rash children” into Google. It comes up with about 99 different potential causes, ranging from Leukemia to a minor skin irritation. Guess which one you’ll gravitate towards? Then there was the time I thought I’d over-dosed on Ibuprofen. I’d been having trouble – again – with Piriformis Syndrome and lost track of how many pills I’d taken in one day. 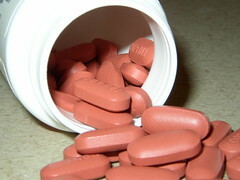 I leapt to the computer, Googled “Ibuprofen” and discovered that adults are only supposed to take something like 1600 mg a day. I’d already had at least 2000. My heart started racing and I frantically reached for the phone to call 999 (911). I was convinced that I was going to die. (Never mind that the dangerous side effects of Ibuprofen run to digestive – not coronary – matters.) By the time the ambulance arrived, the medics practically laughed in my face. On the other hand, I think there are a lot of upsides to this trend as well. I’ve had friends use the internet to correctly identify serious illnesses whose symptoms had flummoxed their doctors. In a thoughtful article in the New York Times last week, Pauline Chen (M.D.) talks about how blogs, Facebook and Twitter have been instrumental to her practice as a physician. Among other things, they’ve helped her and other doctors like her monitor patients, share information, widen illness support networks or just provide a quick word of encouragement. And yet, ironically – as Chen notes – there are very few guidelines in this information age for doctors about how to use social media with their patients. Call me crazy, but as long as we’re about to plunge in and try and totally re-configure our health care system, shouldn’t we be thinking of how social media might be used to further the goals of medicine? If nothing else, it’s free. Which is more than you can say about most things right now. What do you think? How has social media shaped your experiences with medicine? Image: P2090106 by Bright_Star via Flickr under a Creative Commons License. It’s great to be visiting you again and see you’re still producing great articles. Like many others, I will search online for the meanings of symptoms, but also realize some of the information is incorrect. That said, to be an informed consumer, I like how the internet does give us access to some very reliable sites. With health issues, I feel we need to be our own best advocate. Although doctors are well educated, they’re not mind readers, so if we can find a site that describes our symptoms to a “t”, I like the fact we can print out the page and ask to be tested for the disease/condition, thus saving everyone time and money. Thanks, Barbara. I’m finding your blog really helpful. Thanks for visiting again! I never look in internet for a sign or symptom of any illness I suffered or my kids did. Never, never I did. I now wonder why after reading you. Besides all, as an internet-addict person I am, I’m always on-line but I didn’t even think about seeking for a mosquito-bite symptom. I always go to my doctor/pediatrician or to Urgency if something happens between 3 p.m. and 8 a.m. or during weekends. You know I criticize my country if I have to do it, but I must admit social medicine is one of the best thing by here, though it costs a lot to all citizens. Here, everyone has the right “by law” to be attended at any hospital in the country, even though he/she has no work, home or is an inmigrant with no visa o is part of an ethnic minority (e.g. gypsy) and don’t have to pay any euro for that. Everything is “free” or part of medicines are subsidized. For instance it’s well common in Badajoz (close to Portugal border, you know) that Portuguese women give birth here instead of doing it in Portugal (15 kms away), simply because attention is much, much better than in Portugal. Last week I was talking about this with my youngest son’s pediatrician and we agreed that when you’re out of Spain and you need health care is when then you realize that our health attention is better than most of our neighboring countries (which even involves France), but we pay a lot for all of this, and most of Spanish people is not sensible to that. They think this happens in every place in the world (even in the U.S.A.) and it’s not true at all as you are exposing. I don’t have to take care of myself on my own. I mean, I have to, but my doctor reminds me every year and almost forces me to have a gynecologist revision which includes smear test, blood test and mammography. It’s the same with my dental revision, skin, etc. Never happens what you described with your skin. It’s almost a suicide to be dependent of a comparison between pictures. Here, doctors will laught a lot if they advise to do that to their patients, I promise. In the opposite point of view, one situation that bothers me a lot is that we have a semi-Chemist’s in every house. In U.K, for instance, doctors ONLY prescribe you the number of tablets, pills, whatever you have to take and you ONLY buy that amount. Here never happens, we have to buy medicines in their boxes, even if you only have to take 10 pills, you buy 20 or 30!!. What happens with those “free” medicines after you recovered?. You storage them at home but If you never had the same illness again and/or they expired, you simple throw them or carry them agian to Chemist’s to be recycled. Can you believe it?. I don’t know if this money-cost we pay for having exceptional Health care will last for ever. I think we waste too much money in that, we have to be more rational, more pragmatist and pretty critical with our current social health system. I really think this system is unsustainable. If we don’t think about it, future generations will pay this. Hi Delia, The problem is the healthcare system. Here’s an example. I’ve been sick for two weeks with some kind of infection, either sinusitis or impetigo. I called my internist for an appointment and was told the first available appointment was in two weeks. If it’s an emergency, I should go to the emergency room. So I called my dermatologist and got an appointment in one week, which means I was sick for another week until the appointment. She did a culture to find out what kind of infection I have, so I continue to be sick while I wait. It’s not 3-1/2 weeks that I’ve been sick and missing 1-2 days of work per week. She also prescribed a great new ointment for the impetigo which costs $200. The insurance won’t cover it until she tries something else that’s cheaper and finds it doesn’t work or fills out paperwork justifying the expensive ointment. So I wait while either she fills out the paperwork or doesn’t fill out the paperwork and the insurance company makes its decision. No wonder we look on the Internet for something we can do for ourselves while we’re waiting for the awful American health system to help us. I hear you, Dot. You still get delays with socialized medicine but at least you don’t pay for it! !